John Bissonette ’19 left the military seven years ago, but he still thinks of himself as a Marine first. 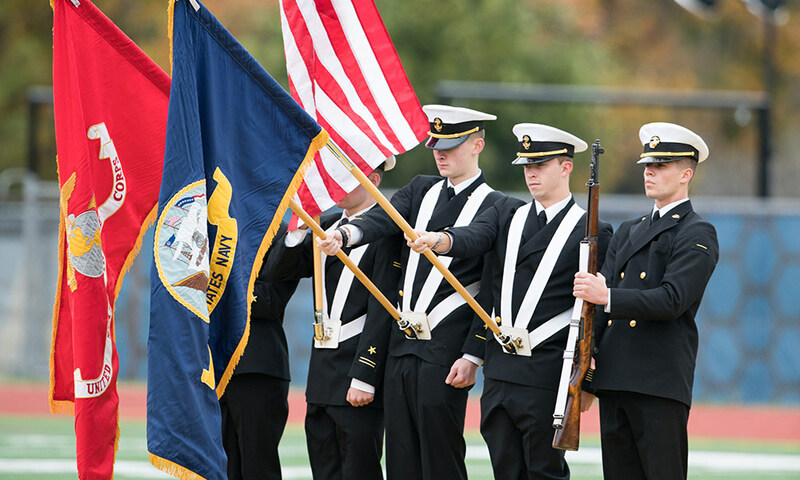 The fourth annual Military Appreciation Football Game kicks off Saturday, November 11, at noon against Hobart College at Fauver Stadium, featuring an appearance by the NROTC Color Guard. Parking and admission for the football game are free. A NOTE: Due to expected unsafe road conditions in the early hours of the morning, the annual Veterans Alliance Run planned for Friday, November 10, has been CANCELLED. Bissonette and Nesbitt have found a niche in the Veterans Alliance, a University Resource Group (formerly affinity group) created in 2013 that consists of active military and veteran members of the University community and their family members. The support network is open to students, faculty, staff, and alumni, and hosts social events throughout the year such as happy hours, panel discussions, a military appreciation football game, and a Veterans Day run. Scott Clyde ’03, executive director of college enrollment, cochairs the Veterans Alliance committee with Nate Kadar ’10W (MS), director of student life at the Simon Business School. Clyde served 10 years in the Marines following college, as a fighter pilot who reached the rank of major. He says veterans who enroll in college after the military face a difficult transition. They’re often older, and the structure of military life is gone. Kadar says many veterans are searching for a way to connect with others who share their experiences. The Veterans Alliance is distinct from the Veteran and Military Families Office, established a year after the alliance. Run by director Pat Toporzycki and school certifying official Kate Ayers, the office is the first place veteran prospective students and their families visit while exploring academic programs and veteran benefit options at the University. Rochester offers tuition benefits to veterans and their dependents through many programs, including Yellow Ribbon, which includes the Rochester Pledge commitment. There were 47 veterans and 20 dependents using military benefits at the University during the 2016–17 academic year.